Whether you prefer ceramic tile, natural stone, or hardwoods, there's no lack of stylish options for today's kitchen flooring. Cork. This often-overlooked natural material comes in various colors and patterns and is sustainable, warm, and slightly cushioned. Seal it to prevent water damage and clean the same as you would a hardwood floor. Linoleum. Easy-to-clean linoleum is available in sheets or tiles in a broad range of colors. Many consumers confuse linoleum with vinyl, but vinyl is a synthetic material with a pattern imprinted on the surface, while linoleum is all-natural with color throughout. Vinyl. This budget-friendly material (about $10-$13 per square yard) keeps upping its image as new technology helps it more closely imitate the look of stone, wood, tile, and leather. Vinyl is available in 6- or 12-foot wide sheets or as 12- to 18-inch tiles that are ideal for DIYers. Easy to clean, vinyl is also soft underfoot. Ceramic Tile. Choices abound for this category, and most selections are highly durable and fairly inexpensive. Select large pieces if you want a more seamless look with fewer grout lines. The downside? Ceramic can be cold and uncomfortable if you’re standing for long periods of time. Hardwood. 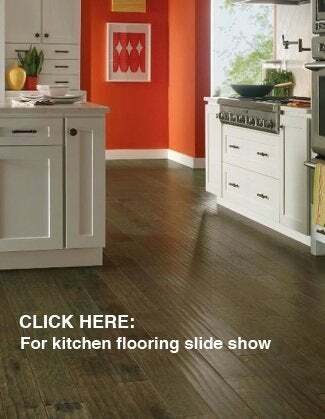 Improvements in products and sealers make wood a viable flooring material in kitchens. That’s good news for people with open floor plans, who wish to use the same material in adjoining living areas. Additionally, wood adds a sense of timelessness and warmth that suits any style, from urban loft to cozy cottage to traditional home.